NASBA Mountain Regional Director Gaylen Hansen (CO) has been appointed to Treasury Secretary Henry Paulson’s Advisory Committee on the Auditing Profession (ACAP), which will hold its initial meeting on October 15, 2007. The purpose of the new group is to study and make recommendations on the overall structure, liability limitations, competition and regulation of the US public accounting profession, relating primarily to the attest/audit function. The ACAP is expected to meet about eight times before culminating its work with recommendations presented in the summer of 2008. Mr. Hansen explained there will be will be three subcommittees: Human Capital – Covering the supply side of the profession, education, curricula in general, qualification to practice, etc. ; Audit Firm Structure – Considering legal organization, capital requirements, legal liability and limitations, and licensing and regulation; Competition – Focusing on interface with clients and how firms are retained, forces that impact or constrain firms, consequences of the loss of another major accounting firm including possible impact on capital markets, structure of the profession, etc. The Treasury Department’s press release indicated Mr. Hansen would be representing “the states” in the 21-member advisory group. He anticipates that he will be called upon during ACAP deliberations to explain the importance of the state accountancy boards’ role in regulation. ACAP Co-Chairs are Arthur Levitt, former chairman of the Securities and Exchange Commission, and Donald Nicolaisen, former chief accountant of the SEC. Other well known members of the group include: Paul Volcker, former chairman of the Federal Reserve; Timothy Flynn, KPMG, LLP, chairman and CEO; Barry Melancon, AICPA president; and Anne Mulcahy, Xerox Corp. chairman and CEO. Mr. Hansen has also represented NASBA on the Public Company Accounting Oversight Board’s Standing Advisory Group and the AICPA’s Professional Ethics Executive Committee. 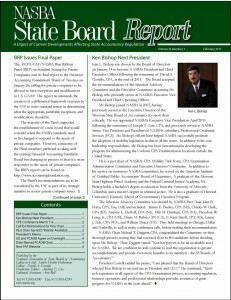 In addition, he has served for several years as the chair of NASBA’s Strategic Initiatives Committee.